One thing I was missing for many many years is a (free) Internet service, that informs you of new music releases for specific artists. I even thought about making such a thing myself. A year ago or so I discovered such a service called soundamus which I highly recommend! One ingenious feature is the integration with one’s Last.fm stats. But the artists considered aren’t limited to your Last.fm profile. Other services like Pandora are also supported and you can alternatively manually define which artists you’d like to track. The resulting list of upcoming releases is available as webpages, an RSS feed and iCal. So you can also integrate that iCal feed into a calendar software like Google Calendar. From my understanding, the data of releases is from Amazon Webservices, so more obscure releases might not be included (but I didn’t notice that so far). There are more features and new features are being added. Check out the Last.fm Group for details on that. Auvisio Alarm Station PX-4000: What a failure! What is an alarm clock good for, if it doesn’t keep the correct time?! Zarro! 0:00! 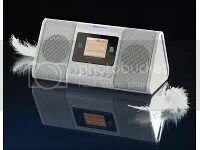 So I decided to get a not too expensive MP3-enabled Radio Alarm Clock and ordered Auvisio Alarm Station PX-4000 from the German mailorder Pearl for 49 EUR. Looks like I bought the last one, because now it’s not available anymore. :] Well, whatever, I’ll continue with my ramblings. The awaited package arrived on Friday and already on Saturday I knew this piece of plastic and metal is pure rubbish. First I was surprised about the quite rather nice sound quality (even though a bit harsh on the highs), but a few hours later I found the clock to be out of sync some minutes. It’s running about 8 minutes too fast per 24 hours! What a joke! Another big downside is the inability to set the volume for your MP3 alarm. It will just play at full volume, letting you wake up with an heart attack and waking up the entire house and probably neighbors of half the street too. :) Additionally, the FM radio receiving is pretty bad. Even the strongest channels have a loud hiss and other static. The manual mentions upgradeable firmware with the software on the CD-ROM. But my package didn’t come with a CD-ROM. In the end I doubt that a firmware upgrade will fix the badly calibrated quartz of the clock. I didn’t find much on the Internet about this device, only one short review and a magazine review I’d have to pay for. So I’ll return it and try one of Pearls other MP3-enabled radio alarm clocks. Neo Diggler is a Firefox Add-on that lets you define and run actions based on your current URL, like jumping to parent folders. It’s the successor of Diggler compatible with newer browser versions. It’s a very useful Add-on, I’d say. I’ll provide some actions I hacked together over the time. I guess there’s be much room for improvement, but they are indeed working real nice for me. Reload the current page from CoralCDN. Opens the BugMeNot entries for the current domain in another window. Doesn’t work in Windows. Loads the current page with an www subdomain (http://some.example.com/foobar.php becomes http://www.example.com/foobar.php). Loads the current page’s base address with a www subdomain (http://some.example.com/dig/around/here.html becomes http://www.example.com/). Loads a current http page as https (ssl). Click the left thumbnail to see how these actions appear in Neo Digglers context menu next to the Firefox address bar. A great help when building Regular Expressions is KDE’s kregexpeditor, part of kdeutils. You can visually compose and analyse your regexes and match them against desired text. And well, while this regex might seem like black magic at first (and second ;) sight, and it can be kind of mind boggling oftentimes, it’s really worth learning it! The syntax is being used in so many places (tools, programming languages) and will come very handy for parsing and substituting texts.